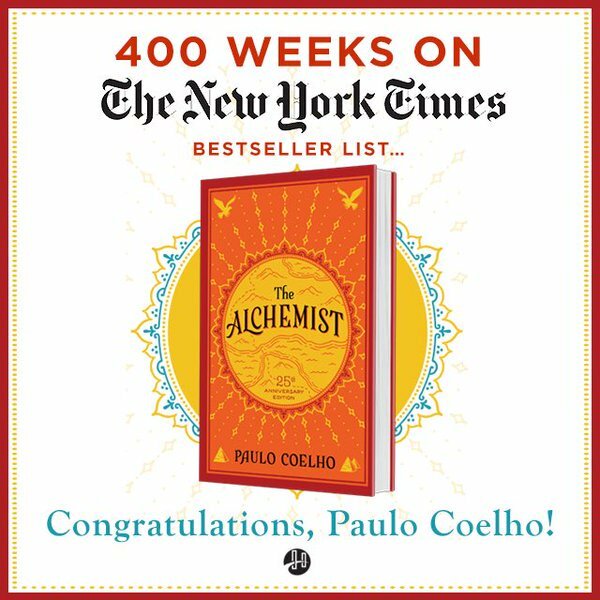 Congratulations Paulo Coelho, Sunday The Alchemist four hundred and twenty three weeks in New York Times best-seller list, ie eight years and two months. What a way to start 2017. Not bad for a book that was first published nearly three decades ago. 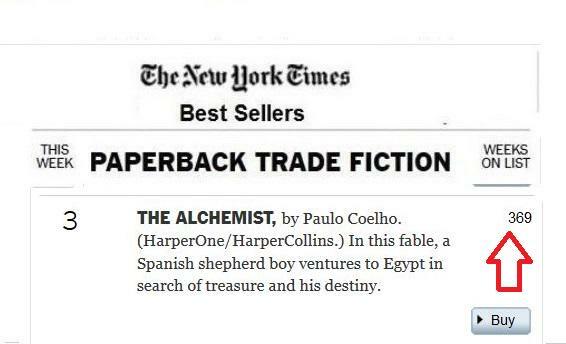 Congratulations Paulo Coelho, Sunday The Alchemist three hundred and ninety seven continuous weeks in New York Times best-seller list. That is an amazing seven years, eight months and one week. And it is at No 8. What a way to end March 2016. And many thanks Paulo and Christina for the St Joseph’s Day Party in The Lobkowicz Palace in Prague Castle the weekend before. And many thanks Paulo for taking the trouble to sign books as you were leaving. 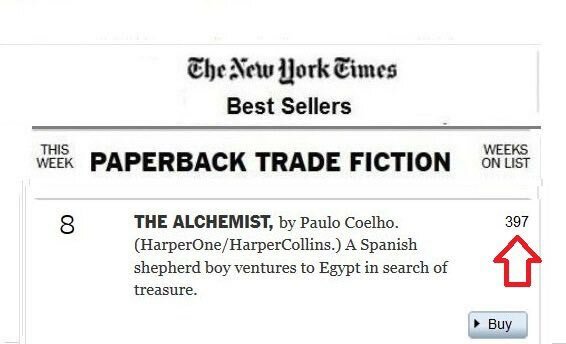 Congratulations Paulo Coelho, today The Alchemist three hundred and ninety continuous weeks in New York Times best-seller list. That is an amazing seven years and six months. And it is at No 5. What a way to end January 2016. 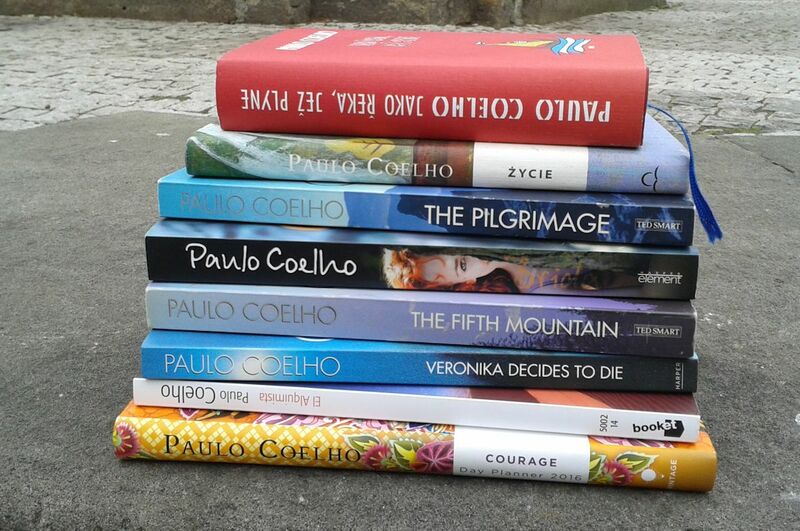 Congratulations Paulo Coelho, today The Alchemist three hundred and eighty-six continuous weeks in New York Times best-seller list. That is an amazing seven years and five months. And it is at No 2. 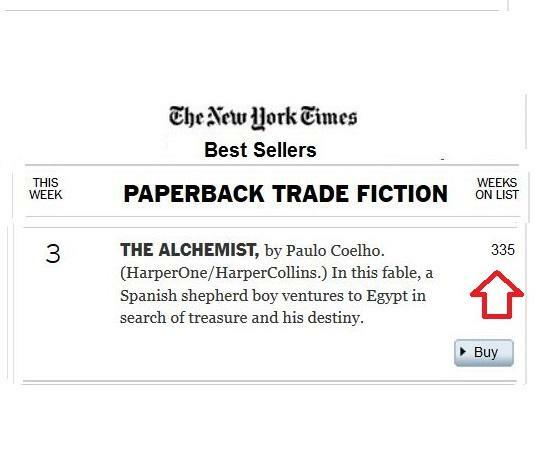 Congratulations Paulo Coelho, today The Alchemist three hundred and thirty-five continuous weeks in New York Times best-seller list. That is an amazing six years and five months. And it is at No 3. The activist and co-author of “I Am Malala: How One Girl Stood Up for Education and Changed the World” relished “The Wonderful Wizard of Oz,” the first book she read in the hospital when recovering from an attack by the Taliban. 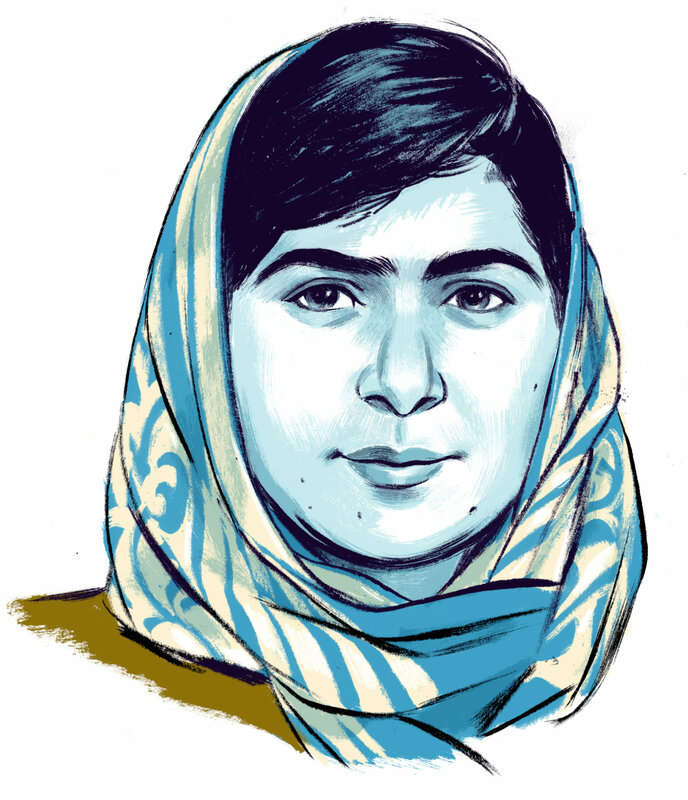 New York Times correspondent Jodi Kantor will continue the conversation with Malala Yousafzai at a Times Talk this evening; click here to watch it live or afterwards. I’ve been reading “Of Mice and Men,” by John Steinbeck, which is on the school curriculum. It’s a short book, but it is filled with so much. It really reflects the situation of 1930s America. I was fascinated to learn how women were treated at the time, and what life was like for poor itinerant workers. Books can capture injustices in a way that stays with you and makes you want to do something about them. That’s why they are so powerful. “The Alchemist,” by Paulo Coelho. I like it because it is hopeful and inspiring. It tells the story of a boy who embarks on a journey to find a treasure, but as he goes along, he learns from every part of his journey and every person he meets. In the end, he finds his treasure in a very interesting place. His story tells you that you should believe in yourself and continue your journey. Deborah Ellis (author of “Parvana’s Journey”) and Khaled Hosseini (“The Kite Runner”). Both tell stories about young characters in difficult circumstances, having to make hard choices and having to find strength. They accurately depict war-torn regions. I like writers who can show me worlds I know nothing about, but my favorites are those who create characters or worlds which feel realistic and familiar to me, or who can make me feel inspired. I discovered Deborah Ellis’s books in the school library after my head teacher encouraged me to go beyond the school curriculum and look for books I might enjoy. This wasn’t long after I arrived in Britain, and I was missing my friends terribly. Reading about Afghanistan made me feel like being back at home. This is the power of books. They can take you to places which are beyond reach. And your favorite writers of all time? What books would you recommend for young people hoping to understand the plight of girls and women in Pakistan today? “Mud City,” part of the “Parvana’s Journey” series by Deborah Ellis. I was gripped by this series and couldn’t drag myself away from it. Ellis beautifully captures childhood in war-torn Afghanistan and Pakistan. The stories are very moving. Is there one book you wish all girls would read? One all students would read? All girls: “The Breadwinner,” by Deborah Ellis. The book tells the story of a young girl who takes on the challenge of saving her family. I think it’s important for girls everywhere to learn how women are treated in some societies. But even though Parvana is treated as lesser than boys and men, she never feels that way. She believes in herself and is stronger to fight against hunger, fear and war. Girls like her are an inspiration. “The Breadwinner” reminds us how courageous and strong women are around the world. All students should read “The Kite Runner.” It shows you should not judge other people by external things. And it shows loyalty and friendship. Were there particular books that helped you get through the recovery process after the attack on you by the Taliban? “The Wonderful Wizard of Oz” was the first book I read in the hospital. I had been having headaches and couldn’t read or focus properly for a while. It is a lovely book, and it was given to me by Gordon Brown — he sent me 25 books, and this was my favorite. “A Brief History of Time,” by Stephen Hawking. I read it during a period when life in Swat was very hard. I distracted myself from the fear and terrorism by thinking about things like how the universe began and whether time travel is possible. I enjoy science, and I’m a very curious person. I always want to know the reason behind everything, big or small. “The Little Prince.” It is a very clever book, and in the beginning it’s extremely funny. I never cry reading a book. Mine! The editing was really hard. Especially because we wanted to get everything right in a very short period of time. The workdays were very long, but it was worth it in the end. What are your childhood memories of books and reading? One of the first books I read is called “Meena,” about a girl who stood up for women’s rights and education in Afghanistan. I also read a biography about Martin Luther King Jr., written for children. But I didn’t read a lot of books when I was young. In our country, many children don’t attend school or learn how to read. Those who do usually read only textbooks. In our classes, we focused more on history, science and mathematics than literature. Many people couldn’t afford books. Most books were secondhand, used by many children before. In Pakistan even schools own very few books. I was lucky to have a father who valued education and thought it was important that I knew how to read. I read eight or nine books in Swat, and I was considered to be a bookish girl! Here [in Birmingham, England] girls have read hundreds of books. One of the most memorable moments in my life was when I was asked to open the Library of Birmingham, Europe’s largest new library. I had never seen so many books and all of them freely available to members of the public. If only children in Pakistan had such easy access to books! People of Birmingham are very lucky to have such a wonderful library. If you could require the American president to read one book, what would it be? If you could require the prime minister of Pakistan to read one book, what would it be? I think it would be disrespectful to say that, but I did read a book recently which I thought was the worst. Someone gave me a book to help me in improving my English. I read a few pages, and I didn’t really like that book and decided not to read it, as it had no suspense. A book should have suspense and grab you right from the beginning. “An Inspector Calls.” It’s actually a play that I saw and enjoyed. It is part of the English syllabus, and I want to read it as well. Originally published New York Times.